Goods discharged on the sheltered beaches here soon found their way inland to Kilmarnock and Glasgow. Ayr itself was the destination for contraband coming in from Ireland, and Dunure and Culzean Bay near Maybole were landing places largely for Irish whiskey, which was known locally as 'Arran Water'. Prestwick and Monkton were also well-known landing places, and the minister of the parish was once accused of keeping the tide-waiter out of the way during a run by drinking with him. On the Irvine road outside Monkton smugglers called at a house (probably now in ruins) called Rum How. This town enjoyed the strongest reputation as the smuggling centre for the surrounding area. Troon Bar provided shelter from the wind, and the smuggling ships would be run up the sands at Barassie Burn, on the Barassie shore. At low tide the luggers were left high and dry, and could be easily unloaded using horse-drawn carts which moved inland along Dundonald Glen and along the road crossing Clevance Hill. Contraband came from the Isle of Man until the island was returned to the Crown, and also from other parts of Scotland. Whisky was the cargo for this domestic trade, and was landed at Port Ronald, which was then reached by a road that had been paved specifically for the convenience of the smuggler's carts. If the goods couldn't be run inland immediately, they were stored locally: many of the houses of Troon are reputed to have brandy holes, or concealed rooms for the storage of contraband, and others have double gables for the same reason. Opposition to smuggling came not only from the customs and excise authorities, but also from the redcoats stationed at Ayr and Irvine. Clashes were frequent, and despite the strength of the opposition, the King's men often came off worse than the smugglers, who armed themselves with loaded whips and 'kents'. These were fearsome oak cudgels, five foot long and weighted with lead. At hand, he wad ha'e skailed the bike'. But dealt and warded many a blow. Despite the conflict between the collectors and evaders of duty at Troon, there are some touching stories that show the two groups in a human light. In one incident, smugglers led by one James McAdam had successfully crossed the swollen River Irvine, when an exciseman on the far bank ignored the smugglers' warnings that the river was dangerous, and dived in to try and cross. He was swept away by the current, and his life was saved only because McAdam himself plunged into the water and hauled the man out. The complement of 20 dragoons could hardly control the mob of 5000. A magistrate who tried to intervene would have been thrown over the quay had he not been caught and dragged into the custom house. The Campbeltown custom house records are a catalogue of defeat, but the low-point for the preventives must surely have been in autumn of 1792 when the authorities seized the smuggling sloop Nancy and Peggy in the Sound of Kilbranan. The events that followed read like a tragi-comedy. The crew succeeded in recapturing their ship, and forced the mate of the customs house cutter and 2 others into a yawl (small rowing boat) which overturned, drowning the mate. 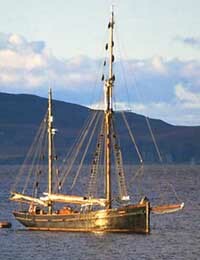 The remainder of the cutter's crew fired on the Nancy and Peggy , and she was eventually taken once more, and brought into Campbeltown. 35, 5'8", brown short hair, florid complexion having a sulky countenance and did not look any one straight in the face but with the tail of his eye. The guard was redoubled, the jailer dismissed, and the keys were thrust upon the reluctant collector of customs. Two weeks later one of the debtors escaped, followed after a further 12 days by another of the smugglers. The last remaining smuggler from the Nancy and Peggy took four more days to get away: he cut a hole in the floor and lowered himself into the courtroom below, escaping through a window! ...a parcell of women headed by one Brown, an old soldier assembled with a piper playing, went to the quay and boarded the vessell, deforced the tydesman, unriged her and proceeded to take the meall...the comptroller who lives a little distance from the office and is obliged to go through a great part of the town was attacked by some women who give him very abusive and threatening language. The Monach (sic) or Heisker Islands of the coast of North Uist were used as a smuggling depot, though a far from satisfactory one. According to some reports, the swell in 1791 was so heavy that two ships took a fortnight to land 1500 ankers of brandy and gin. The smugglers stored the goods in houses on the island, but because of bad weather were only able to take goods off piecemeal, as local demand warranted. South Uist was immortalized in Compton MacKenzie's book Whisky Galore. In real life, the ship loaded with booze was The Politician, and ran aground between Eriskay and South Uist in the early hours of 4th February 1941. For the true story, read Arthur Swinson's Book Scotch on the Rocks (1963).